Alfredo’s was the first bar in Glasgow city centre to have a satellite television system. In 1988 Alfredo’s was the only bar to show a friendly football match between Italy and Scotland. The game was on the Italian channel Rai and Alfredo’s, being owned by the Italian Alfredo Lazzurri, had installed Italian television for himself and his fellow Italian customers. The bar was full and, with a queue outside to get in, the Scottish newspaper the Daily Record turned up to interview Alfredo and the story was carried by the paper the next day. 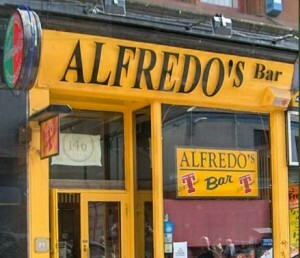 From this day onwards Alfredo’s became a place for Scottish people to come to watch live sports. It now has 15 screens and shows every game that is on terrestrial and Sky television. Several Sky boxes means all sports can be shown at the one time including athletics and golf. Open for over 25 years Alfredo’s is well known for our quality served pints with over 5 awards for best pint as well as over 30 types of malt whisky including our malt of the month. We also serve traditional Scottish food using quality locally sourced ingredients. We’re excellent value for money so put us to the test and you’ll be pleasantly surprised!